There are hundreds of different ways students can describe the best way they learn and retain information. Dr. Brian Walsh breaks these styles down into three, visual, auditory, and kinesthetic. Having made it to my junior year of college, I have had teachers that have taught based on all three of these styles. In my opinion, the teacher has a difficult job because each of his or her students have a different way in which they learn. It is their job to teach each one of them to the best of their ability, however it is not always easy. I remember struggling through my math classes my entire elementary school education. 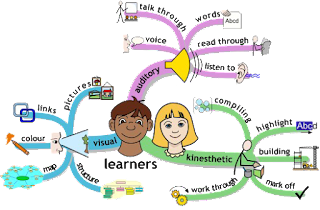 I strongly believe that I am not a kinesthetic learner, which I believe math is a lot of. I learn by visually seeing definitions, and then looking at photographs or videos of the event happening. It was difficult for me in my elementary classes to find explanations of a formula or problem. I remember asking my teachers to show examples over and over, feeling annoying. The education system today is very diverse, however I feel more should be done to catering to learning styles. I remember the video from the lecture on Learning styles and how learning in different styles doesn't really improve effectiveness but I found the quiz interesting nonetheless! It was a lot of fun! I took the quiz and it said that I am an auditory/visual learner. I personally feel like I need a mix of different things to help me remember and I don't have one specific way that helps me learn. I also believe that the way I learn differs by what I am learning. Things like math I will have to keep practicing the steps of equations, but when I took science classes I would think of associations to help me remember the names of things and what they do. The quiz told me I am a tactile learned which I think could be pretty accurate! I like how you described your experiences with different learning preferences throughout elementary school and I think that being successful in college comes down to those learning preferences a lot. In middle school and high school, the teachers are more so inclined to teach in a specific manner while in college, professors teach in many different ways so it comes down to the student to identify how they can best learn and retain the information outside of the classroom and while studying. The quiz you posted was very interesting. Instead of displaying one out of the three possibilities, it gives a percentage of all three and which ever percentage is greatest, is the target learning style. If one were to answer every question to have a 100% in one category than it could be said that, that person has a strict learning style, but if everyone scores the same as I did (similar figures in all three) than just one learning style isn't conducive to learning everything.